As NASA continues to explores Mars through its rovers, believers in extraterrestrial life keep pointing out discoveries of their own. Scott C. Waring of UFO Sightings Daily says he's found a fossilized fish on Mars . In an image of the Martian surface recently released by NASA's Curiosity rover, the surface of the Red Planet appears in black and white. Near the bottom of that image is a rock that does, in fact, look a little bit like a fish. Waring notes on his blog, "Last year NASA announced that there were oceans on Mars and that it did look a lot like Earth in many ways. I guess this petrified fish is proof of that." So, is there something fishy happening on Mars? Almost certainly not. 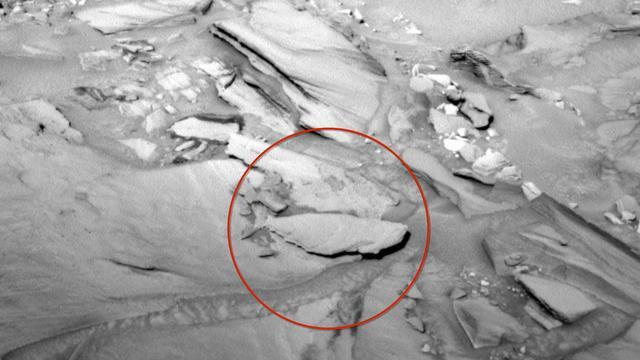 The so-called fish sighting is most likely an instance of pareidolia where the brain is tricked into seeing familiar objects in surfaces like rocks. In the past, alien hunters have identified a bevy of largely inexplicable objects, including a large floating spoon, a giant mouse, and a handgun on the Red Planet.